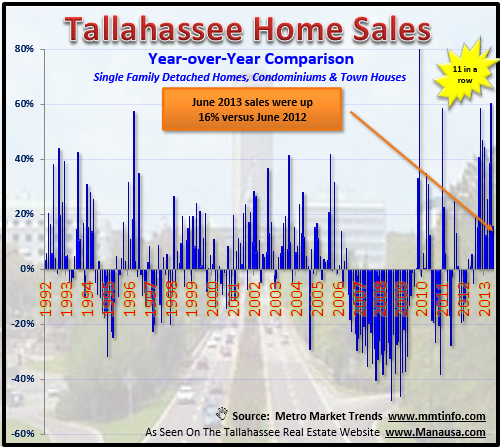 Our latest year over year report shows housing sales up for eleven consecutive months, marking the longest positive streak in the Tallahassee real estate market in more than twenty years. Yep, that's right. This streak is longer than any we experienced during the boom of the housing market from 2002 through 2006, and no time in the 1990s did we see year over year housing sales up for 11 straight months. The year over year home sales graph below is one important graph that we like to monitor each month. It lets us know how well the market did in the most recent month (June 2013) versus the corresponding month from a year prior (June 2012). I use this report in a similar fashion as large retailers would use the "Same Store Sales" report to assess growth in a market by a specific store (which for us would be a specific product ... homes for sale in Tallahassee, Florida. The blue lines in the real estate graph above measure the positive or negative change in year over year home sales each month. At the far right, we see housing sales up 16% in June 2013 over June 2012, and it represents eleven straight months of gains over the prior year. A grave concern about the housing market recovery continuing has emerged as mortgage interest rates have soared 28% in just a few weeks. With interest rates moving from 3.5% to 4.5%, the average borrower has seen their "cost of money" increase by 28%. I don't know about you, but I would consider it very painful to see my home mortgage payment increase 28%. This increase in the cost of money is going to reduce home affordability, and it will likely result in a reduced buyer pool for homes in all but the lowest price points. Thus far in 2013, we've seen housing sales up during historic low interest rate opportunities, I just hope it continues as we progress into less favorable (though still incredibly low) mortgage interest rates. If you would like to buy a home in Tallahassee and want to know how to maximize your borrowing power, just drop me a note and we can schedule a time to review your personal situation and goals.